Alright. I know. We've posted this before... But I'm off in Red Rock working at the seventh annual Red Rock Rendezvous and didn't have time to get you an original article this week. Hold your breath! Okay, you can let it out now. There wasn't that much a reason to hold your breath, because the 2000 film, Vertical Limit is dumb. Maybe I should make this a little bit more clear. 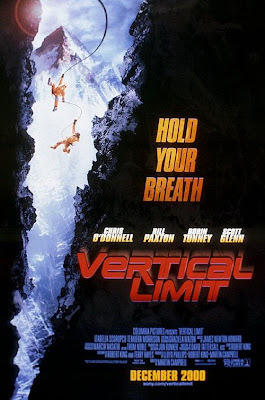 Vertical Limit is perhaps the most ludicrous climbing film of all time. There is not one iota of truth or reality in the entire movie from the beginning to the end. And in many cases, the storyline is so outrageous that it is actually comical. That video cracks me up every time. Are there classes I could take that would teach me to climb without sweating, getting dirty, or messing up my hair? Please leave this post up through Monday 3/22! I need it as the wrap up for a power point demo on Blogging in Experiential Education. I'll leave the class on a high note with Vertical Limit. . . . Thank you for heartstopping laughs. Check it out when it comes around or comes out on DVD. You will be glad you are going home to a warm bed (or tent) afterwards :) Berg Heil!